We are only at the beginning of another season, and already I miss seeing flowers blooming. Our hot weather was just too short when I looked back. Half of the time it wasn't hot, but wet, cold and gloomy. 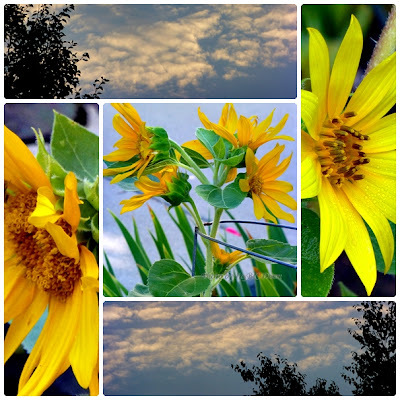 None of my sunflowers grew taller than me this year, but I had one plant against all odd, the photo in the middle, had FIVE flowers on one stem! It was so heavy that I had to use a tomato cage to aid its weight. Winter will soon be here, bringing with it freezing temperature and snow. I am not ready for it or looking forward to it. Can we pull it back to summer, to early fall, or to spring? Can we just say: "wait" or send the snow away? we don't get very cold here and flowers don't stop blooming ( but not the wildflowers), wishing with you that there won't be a lot of snow there this year. What a lovely splash of colour! Oh how I wish sunflowers were still in bloom here in Ontario!